Some people can do just about anything they put their minds to, and Russian violinist Viktoria Mullova is certainly one of these. After starting a career playing modern violin in the outskirts of Moscow during the Soviet era and serving up a steady diet of Tchaikovsky, Stravinsky and Prokofiev, Mullova decided to add historically informed perfomance practice to an already impressive skill set and completed the transition with an album of Beethoven and Mendelssohn violin concertos with the Orchestre Révolutionnaire et Romantique in 2003. Thirteen years later, Mullova has gone on to perform with the Orchestra of the Age of Enlightenment and with Venice Baroque, and is now a regular collaborator with Accademia Bizantina, a newer group on the European Baroque scene led by Italian harpsichordist Ottavio Dantone. The results have been impressive – Mullova has been plowing through the Bach chamber works, including the six Bach sonatas for violin and continuo, the violin concertos, and the solo sonatas and partitas – and her Vivaldi and Mozart concertos aren’t too bad either. Ontario audiences will have ample chance this month to hear both Mullova and Dantone in both Kingston and Toronto, as the pair, along with Bizantina, will be touring an ambitious program of Bach concerti to both cities. Catch an international violin virtuoso along with a superb backing band in Kingston at the Isabel Bader Centre for the Performing Arts on November 12 at 7:30pm, and in Toronto at Koerner Hall on November 13 at 3pm. Esfahani, harpsichord virtuoso: Solo harpsichord recitals are all too rare in Canada, but with internationally reknowned Iranian-American harpsichordist Mahan Esfahani coming to the Isabel Bader Centre for a concert on November 20 at 2:30, Kingstonians will have a rare opportunity to hear an up-and-coming virtuoso. Esfahani is just 32 years of age, but is already proving that he can do just about anything on the keyboard, with a repertoire ranging from Byrd to Ligeti (via CPE Bach and Rameau). And he plays all these composers rather well – each of his three albums netted Esfahani a slew of awards as well as accolades from critics. His Kingston audience will have a chance to decide the level of Esfahani’s virtuosity and versatility for themselves when he shows off a program of works by Bach, Rameau and Sweelinck. Montrealers reading this may also take some small comfort in the knowledge that if they want to hear this rising star, they need not drive all the way to Kingston – Esfahani will also be playing in Montreal on November 24 and 25 with Les Violons du Roy as part of Bach Sans Frontières, with another virtuoso concert – he’ll give his Montreal audiences both the Górecki harpsichord concerto and a Bach concerto with a cadenza by Brahms. An Italian noblewoman being shipped off to become queen of France doesn’t seem like a particularly unusual event for Renaissance Europe – unless of course that particular Italian noblewoman happens to be descended from the most notorious, corrupt and despised family of political millionaires in history. The Toronto Consort explores this in their concert program “The Italian Queen of France,” by telling the story of Caterina de’ Medici, who found herself married off to Henry II in 1549 as a means of consolidating her already powerful family’s influence throughout Europe. Calling Caterina the Italian Queen of France is an entirely appropriate title too, as the French never forgot – or let the queen herself forget – that she was an outsider in their country. Whether this could be attributed to anti-Italian sentiment or to the extremely negative reputation of the Medici family is perhaps one of the great debates of Renaissance history, but the French must surely have known that Caterina’s cousin was the de facto tyrant of Florence who bought politicians and judges to do his bidding. There was also another cousin of Caterina’s, Giulio (aka Pope Clement VII), who was skewered in one of the most bitter political feuds of the century – he was the pope who had to tell Henry VIII of England that he couldn’t annul his marriage to Catherine of Aragon, as her brother was occupying Rome with an army at the time. Like the rest of her family, Caterina wasn’t particularly popular. She suffered from rumours that she was a witch with links to the occult, and the fact that she was both interested in astrology and a personal patron of Nostradamus didn’t help this at all. Still, if there was one thing the Medicis knew how to do well, it was to bolster a bad reputation through artistic patronage and, as the theme of the concert implies, one way the queen tried to counteract a negative reputation was through lavish – and eventually ruinous – spending on the arts, including music. French Renaissance composer Claude Le Jeune was a particular favourite under the Italian queen and features prominently in this program; the Consort will also feature music from his contemporaries Adrian Le Roy and Guillaume Costelay. Catch their show November 11 and 12 at Trinity-St. Paul’s Centre at 8pm. Toronto Masque Theatre: Another group that’s good for at least one early-music show a year for Toronto audiences is the Toronto Masque Theatre, as they’ll demonstrate this month with performances of Handel’s Apollo e Dafne, at the historic Enoch Turner Schoolhouse on November 17 to 19. Handel was just 24 years old when he began working on this secular cantata for a Venetian concert-going public, but Venetians never got a chance to hear it. Instead, the budding opera seria master shelved it for a year and finally premiered it to a German-speaking audience in Hanover. Somewhat oddly for a Handel work, the overture has been lost, and modern perfomances typically substitute a Handel opera overture instead. 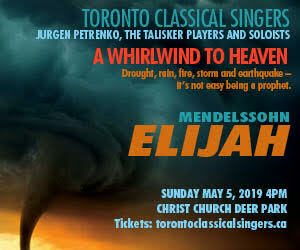 No idea if Toronto Masque Theatre will do this, or indeed perform any overture at all, but the concert is a great chance to hear some rare and early (indeed, pre-opera) Handel. Tafelmusik: And finally, while all of these concerts are worthy of our attention, let us all take a moment to appreciate the most industrious group of period musicians in Canada. I’m speaking of course of Tafelmusik, who will be presenting at least five different concert programs before the next issue of The WholeNote hits the shelves: “Let Us All Sing,” November 2 to 6, celebrates the Tafelmusik Chamber Choir at 35, under the baton of Ivars Taurins. Members of the ensemble make visits to Western University’s Don Wright Faculty of Music November 18 and 24. “Close Encounters…,” an intimate new (and almost completely sold-out) series features “Close Encounters…of the Italian Kind,” November 25 and December 3. Finally, “A Grand Tour of Italy,” with the full Tafelmusik orchestra, December 1 to 4 and again December 6, will be conducted by Rodolfo Richter, violinist of the acclaimed early music group, Palladian Ensemble. Richter, who opened Tafelmusik’s 2015/2016 season, is becoming something of a regular; he will be back in March 2017 for “The Baroque Diva” with Karina Gauvin. I’m not sure what has motivated what must be close to a record-breaking run of artistic output for an already prolific group, but Toronto and area audiences will have a slew of concerts to choose from in the next few weeks. Among them, one particular show this month stands out for me: “Haus Musik: Underground Elysium” is an attempt to de-formalize classical music and help it appeal to a younger audience. At 8pm on November 24, Tafelmusik will be taking over The Great Hall on Queen W. at Dovercourt, in a program that includes Marini, Purcell and Pachelbel. It’s the second season for Haus Musik, brainchild of new managing director William Norris, and is a step forward for the ensemble, offering a new way to enjoy old music. It’s well worth coming out to see. Concert halls don’t seem to appeal to a generation that, with iPods and music streaming approaching their third decade, is determined to consume culture on its own terms. If enough young people go out to this show and end up liking it, Tafelmusik will have secured a future audience for classical music – and will be the number one group in the minds of new listeners. Nov 19: Scaramella presents “Mysteries: Joyful and Sorrowful,” works composed for the imperial chapels and courts of the Habsburg Empire by Schmelzer, Biber, Froberger and their 17th-century contemporaries performed by Ingrid Matthews, baroque violin; Joëlle Morton, bass viol; Matthew Girolami, G violone; Sara-Anne Churchill, harpsichord/organ at Victoria College Chapel. Nov 30: Alison Melville, traverso/ recorders/ kantele and Julia Seager-Scott, clarsach/triple harp present “Border Crossings,” including works by James Oswald, Turlough O’Carolan, Corelli and Vivaldi, at Heliconian Hall.